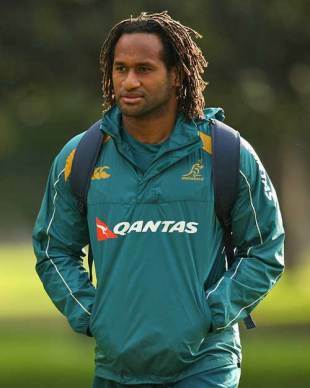 Lote Tuqiri and the Australian Rugby Union (ARU) have settled their legal action out of court. The 29-year-old former Wallabies and Waratahs winger was sacked by the ARU on July 1 and had his reported A$1million-a-year contract torn up after allegedly breaching the player code of conduct. Tuqiri subsequently launched a claim for unfair dismissal but no further details regarding the player's actions have been made public by either party. "Following mediation discussions between the parties, an agreed settlement has been reached and Mr Tuqiri has agreed to discontinue his proceedings against the ARU and NSWRU," the ARU said in a statement. "The parties do not intend to make any further comment." Cardiff Blues winger Leigh Halfpenny is expected to make his return from injury in Friday's pre-season clash with Northampton Saints. The Wales international capped a stand-out season last year with selection for the British & Irish Lions but saw his tour ended by a thigh injury. "I expect Halfpenny and [Wales prop] John Yapp back [against Northampton]," coach Dai Young told BBC Sport Wales before revealing the comeback plans for two of his other Lions - Jamie Roberts and Andy Powell. "Certainly Jamie won't be starting the first [Magners League] game, he'll come in maybe late September. We judge it on an individual basis. Andy, as we know, is just raring to play, we've got to hold him back at the minute. He certainly won't be involved [against Northampton], he may play some part against Edinburgh [in the first game of the Magners League on 4 September]." Premier Rugby are confident this season's Guinness Premiership will be the most popular ever with season ticket sales on the rise around the country. Reigning champions Leicester Tigers have seen a 10% increase and have eclipsed their previous record of 13,100 season tickets sold. Following the completion of the new Caterpillar Stand the capacity at Welford Road will be 24,000. Newcastle Falcons have seen sales rocket by a staggering 55% on the back of reduced prices while Saracens (30%), Harlequins (25%) and London Irish (20%) have also reported large increases. Premiership newcomers Leeds Carnegie have seen tickets sales rise 50% ahead of their return to the top flight. Premier Rugby Chief Executive Mark McCafferty said, "The clubs are offering great value for money, family entertainment and supporters are taking the opportunity to sample the unique colour, passion and noise that a club match provides for themselves." Auckland and Bay of Plenty will compete for the inaugural John Drake Boot when the two teams contest an Air NZ Cup match in Auckland on Sunday. The trophy, a boot electroplated in silver, commemorates former All Black and Auckland representative prop, John Drake, who died suddenly last December at the age of 49. He wore the boot in the 1987 World Cup final defeat of France. In 1998 Drake and his family relocated to Mt Maunganui, where Drake became a rugby media commentator. Waikato Stadium is nearly sold out for next month's Tri-Nations clash between New Zealand and South Africa. The Hamilton ground has had its capacity boosted to 31,500 for the September 12 Test which will be its first Tri-Nations fixture. Leeds Carnegie fullback Leigh Hinton is set to be sidelined for the next 10 weeks following surgery on his injured shoulder. The 30-year-old, who was the side's leading tryscorer last season in the old National League One, suffered the original injury during Leeds' 19-14 pre-season victory over Aurillac earlier this month. "It's very frustrating but these things happen," he told BBC Radio Leeds. "Once I've recovered from the operation it will be like starting pre-season all over again and will have a hard 10-week training programme set out for me." One-time All Black Sosene Anesi has signed with the New South Wales Waratahs for next year's Super 14 rugby competition. The Waikato and Chiefs speedster has been unveiled as their marquee overseas import and outside back replacement for sacked Wallabies winger Lote Tuqiri. "This is a significant signing for us," said Waratahs coach Drew Hickey. "They don't just give away All Blacks jerseys, so to secure a New Zealand test player is pretty exciting for us as a team, and indeed the whole organisation." Anesi will become the third New Zealand player in the past year to switch to an Australian franchise. Flanker Daniel Braid played this year's Super 14 for the Reds while prop Ben Castle returned from Europe to link up with coach John Mitchell's Force. The Australian Rugby Union (ARU) opened the way this year by allowing each Super 14 side one marquee overseas import. Worcester Warriors have announced the signing of utility back Calum MacRae from Edinburgh Rugby on a one-year deal. The 29-year-old, who was called up to the Scotland squad for the 2008 Six Nations Championship, has moved to Sixways Stadium until at least the end of the 2009/10 season.